Natural looking food and/or water dish for terrariums with steps to help reptiles get in and out with a textured bark design. 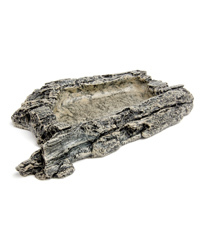 Made from high density resin, the Habitat Bark Bowl helps create a natural-looking reptile or amphibian habitat. Hygienic, easy to clean & low maintenance. "I am really impressed at how you have taken the time to reply to my emails"